To make furniture more interesting or interactive, nodes that accommodate the avatar can be added. 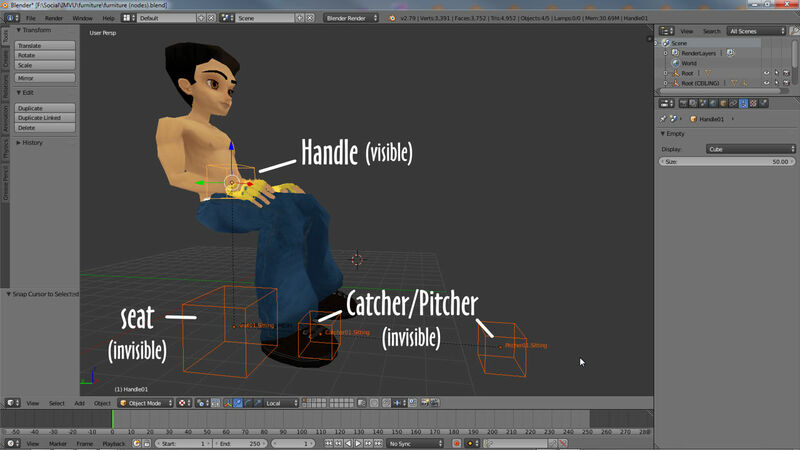 These seating or avatar spots can be set up to trigger or use the avatars default sitting, standing, or optional custom poses designed to make the avatar do something, like pushing a box around or kicking a football. The element that highlights these spots is the seats Handle. See here for more information on furniture nodes, Catcher & Pitcher nodes, and Seat Handles. If no seats are included IMVU does not add them as it can with rooms [link to rooms] because they are optional and not required for furniture to work properly. GOAAA…! Where did the ball go?! In IMVU the seat Handle node indicates to the user an available pose spot, which might then trigger an animation, pose or action. They are essentially the only component Users directly interact with in the client and generally indicate two things; 1) the availability of avatar spots, where the avatar can be moved, and 2) the Interface element, as an icon, Users click to initiate an action. All seats have Handle nodes – *.Sitting, *.Standing, *. [custom] – which are typically positioned relative to where the avatar is expected to appear. For more on furniture seating and skeletons generally click here [link to furniture-skeleton]. If a seat has no Handle IMVU will automatically generate and insert one into the scene but not always where they should be placed leading to some odd ‘accidents’. Seat Handle. The element users click to move around is the Handle, one of four nodes comprising a ‘seat’, places where the avatar appears, which will trigger either a default or custom avatar animation or pose. 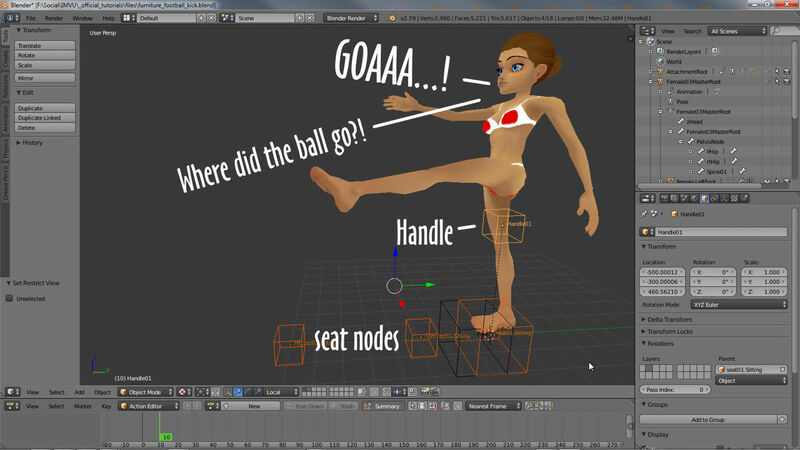 As part of a seat group, the four nodes necessary for an avatar spot to work, the Handles default position is the same for the two default Sitting and Standing node groups, thigh height for standing and abdomen (approximately) for sitting poses and directly above the seat[n] node. This keeps the User Interface aspect of the function, what users see, consistent and in the same place across all spot types so that for most standard seating, their positions do not need to be altered. 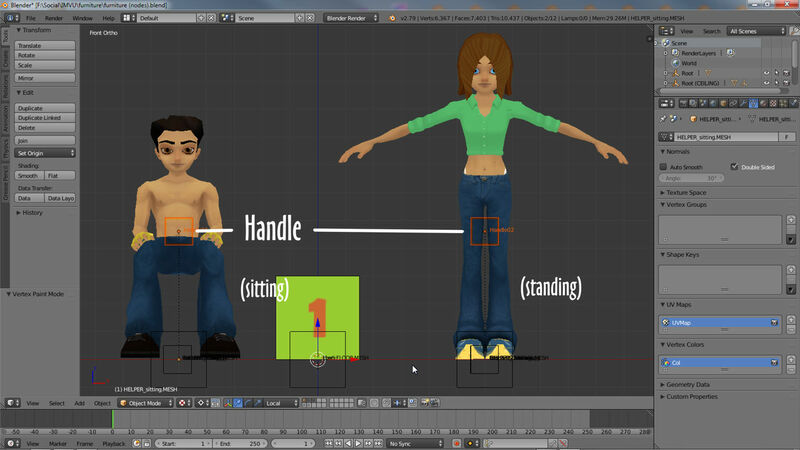 Although nodes are discussed (and shown), the same requirements apply to using Armatures and Bones (or a mixture of Armatures and nodes) for seating when using Blender to make furniture with seats/poses. Handled. The default position of the Handle node won’t generally need to be changed for typical seating or pose spots located as they are directly above the ‘seat[n]‘ node about thigh high for standing and abdomen for sitting positions. Occasionally furniture might need a number of poses in close proximity to one another, different positions on a yoga mat for example. To avoid confusion in having the User clicking the same place multiple times in an attempt to toggle though the available Handle nodes, they can be repositioned around the mat making each yoga pose more easily accessible. Wherever possible however, its best to try and keep Handles near the pose spots they are paired with. 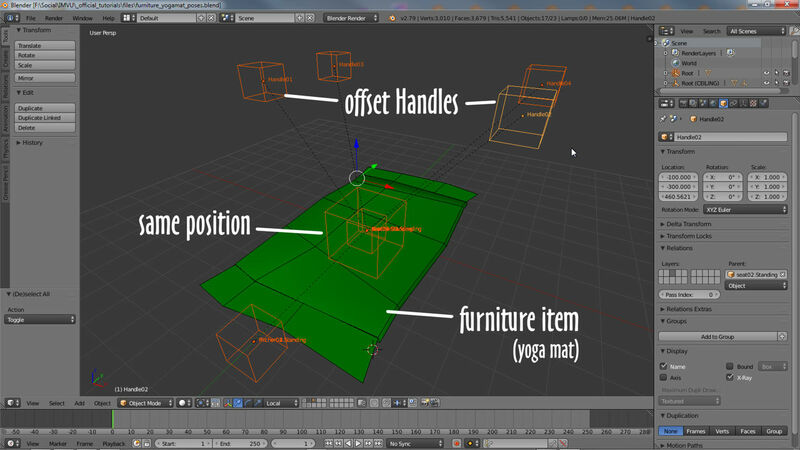 In Blender this simply means right-click selecting a Handle node and reposition using the widgets handles. When re-positioning or offsetting Handle nodes in Blender, make sure to note which node belongs to what seat group. This might mean making sure to rename nodes before moving them – move the group then modify the Handle node. Note also Handles may break if rolled or pitched (rotated front/back, left/right). The default position of seat Handles can be changed, for example offsetting them to one side making it easier to select each one for a stacked item (several poses in the same spot). As with all other nodes associated with furniture, to ensure everything works the way it should Handles must be linked to the Root node of the furniture item and not any of the other seat nodes. In Blender this means selecting the Handle node then Root node (selection order is important), and from the Object menu selecting Parent » Object then Object (Keep Transform) in the Set Parent To pop-up. Moving the Root node will now move the Handle node confirming the correct relationship. 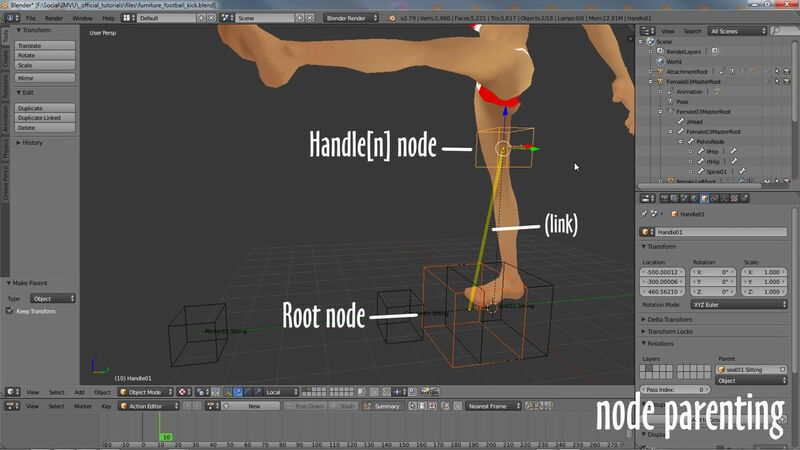 If the Handle node is not parented to Root IMVU may consider the item broken, inserting what it thinks is the missing node, which may result in it appearing in an odd position. Parenting. Like all furniture nodes, Handle nodes must be parented to the furniture’s Root node – select Handle then Root and Parent.